1. 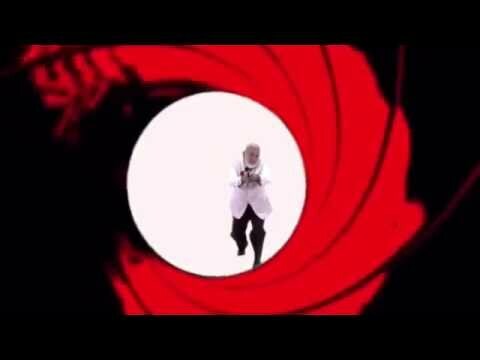 The Best, James Bond Lookalike Promo ! 3. March Of Dimes 007 Gala ! LAS VEGAS "The Reel Awards"
So Nice To Have Made This List ! 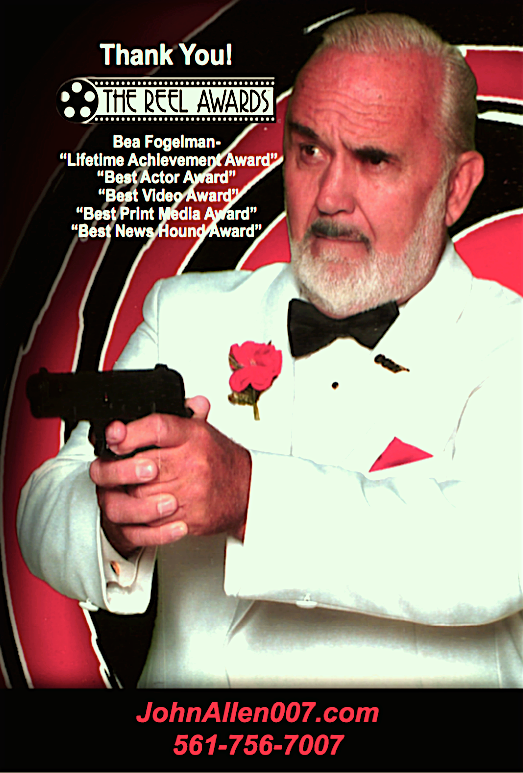 Sean Connery , Impersonator,Fontainebleau Miami Beach presents "James Bond Gala"
Sean Connery .Lookalike, Judge for "CELEBRITY IMPERSONATOR T V SHOW"
Entertainment Industry's Most Requested Sean Connery James Bond Lookalike Impersonator WORLDWIDE. Winner of the Industries Most Prestigious Award "The Mirror Image Award ". Named by Cosmopolitan Magazine one of "The Most Unbelievable Celebrity Lookalikes Ever". After World Wide search John Allen was chosen as Sean Connery"s stand-in film double. Seen on, Rachael Ray,Jay Leno, Oprah, CNN,TMZ, and ABC. Over 1000 appearances as James Bond in Las Vegas and around the world. Perfect as 007 emcee for any event.The charismatic way he handles himself on stage is much like the elegant James Bond figure.He will Leave your guests Shaken and Stirred with Bond excitement ! Have secured the talents of John many, many times and he is always the HIT of the party. Always gives his all and more.You won't find any better in the industry. I give my highest recommendation for this James Bond lookalike who I would describe as professional, comical, and entertaining. 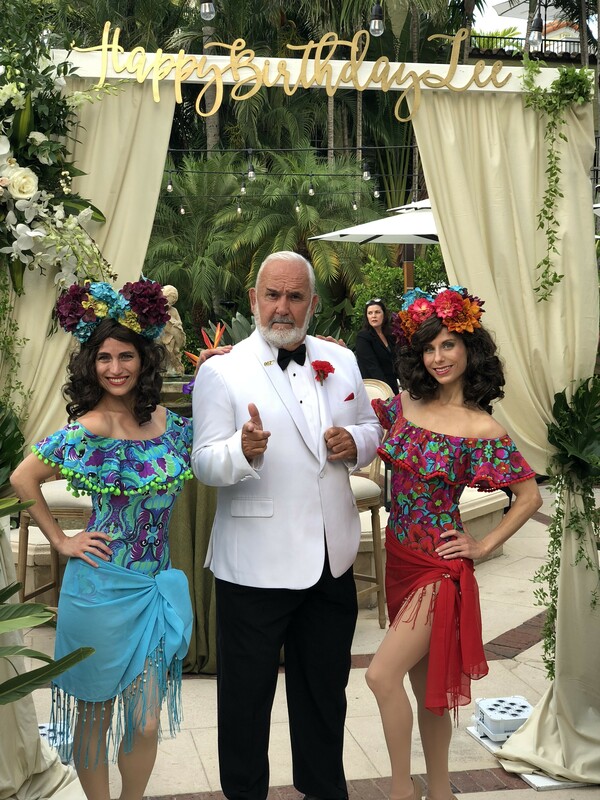 I work as an Event Planner for a destination management company in Palm Beach and we have hired James Bond for a handful of our corporate events. We have received rave reviews from the attendees as he is one of our most popular and personable lookalikes. Thank you so much John for being part of our event. Your presence and outgoing personality made everyone excited to have Mr. Bond around! Thank You Ana it was a Great Fun Group .Really enjoyed Bonding with everyone ! I have always been a James Bond Fan. John came as Bond and inducted me into her majesty's secret service. Now I am 008 with a certificate to prove it, We had 100 guests at the Boca Resort and many guest thought that Sean Connery was actually in attendance. It was great fun and John managed to interact eith every guest. He is the best and highly recommended! 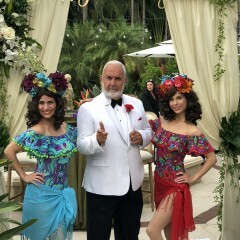 Great James Bond Themed Party ,held at the perfect venue "The Boca Raton Resort" . All who attended appeared in James Bond elegant attire. From the beautiful Bond-girls to the very playful villains. So happy everyone had a wonderful time Bonding with Bond ! Thank you 008 for the opportunity ! John Allen/007 was extremely accommodating to our committee and our event........whatever we wanted, whenever we wanted! "Bond" is in the building ! Your guests will believe Sean Connery has arrived . Over-Whelming Exciting Satisfaction! This is what you and your guests can expect . My clients come from all over the world and every background industry . All have been Thrilled with My Bond appearances. Of course SEAN is always their favorite Bond character. FULL JAMES BOND Show with Bad guys,beautiful Bond-girls ,exciting Bond movie theme singers,Dancers,Martini Bar, Ice sculptors,Casino gaming tables, cars ,James Bond skits etc.. Look forward to making your event a very special memorable occasion. James Bond Lookalike,Sean Connery Impersonator, John Allen ,Tribute Artist. Has won many industry awards in Las Vegas as James Bond,007. John Allen Was Named as One Of The Best Celebrity Lookalikes In The WORLD by Cosmopolitan Magazine. He is available for events from Los Angeles,Las Vegas, New York , Florida and anywhere in between. He has acted as emcee for many national charity fundraisers and numerous corporate awards conferences. Please contact John at http://www.johnallen007.com Now offering, James Bond show with Bad guys,Bond-girls,Dancers,Theme singers,Ice sculptors, Martini bars, and Scripted James Bond skits. " MIRROR IMAGE AWARD" winner at Sunburst convention for Celebrity Impersonators. He will leave your guests Shaken And Stirred with excitement ! http://www.johnallen007.com/testimonial1.html) — Hi John, Just wanted you to know how wonderful everyone thought you where at both of are 007 James Bond customer appreciation events. In Denver and St Louis All of the attendees where so taken with your appearance. 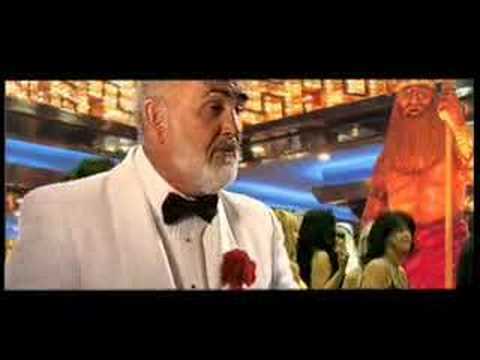 Many thought at first glance that Sean Connery was actually there. You did more then we ever expected with your meet and greetings then posing for photos. When you spoke using Sean's voice it really made for special moments. 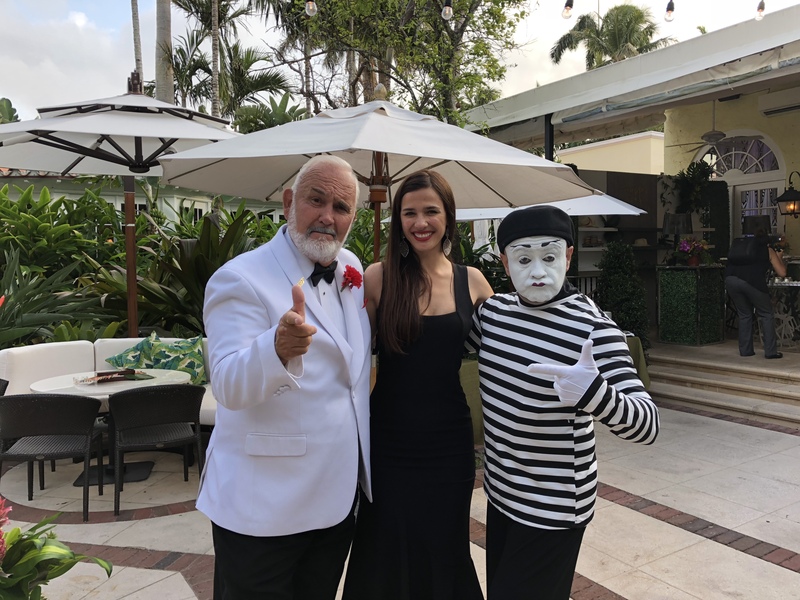 Also during the on stage presentations you really made the evening with your James Bond skits and where so kind to include many of our VIPs , they loved it.The ease at which you handled the onstage awards presentation was so professional. Thanks once again these where very important evenings for us and your elegance, sophistication and class really made the evenings a total spectacular and very memorable. Look forward to working with you in the future. Sincerely , Cindy Hupperts , Marketing Coordinator MIDLAND OPTICAL St. LOIUS Mo. You look like a million dollars, sipping on a vodka martini in a room filled with "beautiful people." Then suddenly, you hear your name announced: you've won Gold! You glide effortlessly onstage to accept your AMBIT Award from... James Bond? It's no daydream. Thanks to Gold sponsor Nicholson Kovac, the Ambit Awards will feature John Allen, a nationally known impersonator of Sean Connery as James Bond, as the event emcee. Allen is the winner of a national "Cloney Award" for Best Impersonation of a Living Legend. He has appeared on the Jay Leno Show and numerous corporate events for companies such as Firestone, Honeywell and Anheuser Busch. The AMBIT Awards will mark Allen's first appearance ever in Kansas City. The AMBIT Awards will also feature a martini bar, courtesy of sponsor UMC Print. Attendees at the event will be able to purchase a martini for the price of a beer or a glass of wine. "AMBIT Awards 005 will be a fantastic evening of fun, showcasing great marketing work," says Elizabeth Usovicz, AMBIT Chair.